It’s often easiest to grasp why word of mouth has been successful when it’s a subject close to your heart. Maybe that’s because it’s geekiness, the inextricable combination of knowledge and enthusiasm, that drives so much of the good stuff that happens online. This example of a non-profit campaign using social media is one close to my heart, and shows how a simple, low-cost idea can get great results. The British Trust for Ornithology (BTO) is the UK’s largest organisation dedicated to the study of birds, and has just turned 80 years old. It delivers a scientific view of how our wild birds are faring, undertaking research and mustering thousands of volunteers to conduct surveys every year. 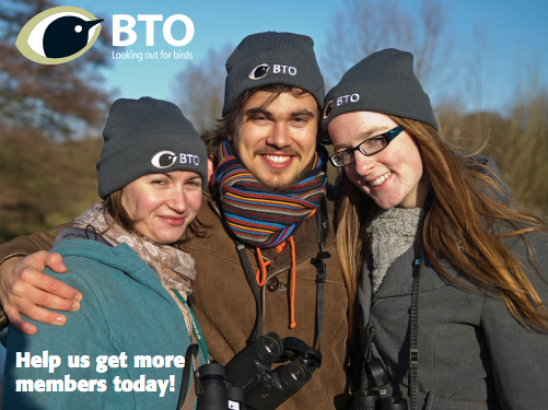 The BTO has modernised in recent years, but it’s still a niche organisation, with fewer than 16,000 members. To put that in context, its big-brand cousin the RSPB has over a million. Late in 2012, the BTO launched a member-get-member recruitment campaign. The proposition was simple: join the BTO for six months for just £1 via direct debit when you’re referred by an existing member (compared to the usual £32 for annual membership). The campaign was launched via their offline supporter comms, and echoed on their website, e-newsletter and social channels, with a specific appeal to members to use Twitter and Facebook to spread the word. A league table was drawn up to show who had recruited the most new members, and those referring were entered into a draw to win a weekend break. By early 2013, the drive had attracted nearly 500 new members – some 19% of all those recruited in 2012, and a 3% overall increase to the membership base. Six months on, almost 90% of those who signed up have renewed. Not bad for a campaign with minimal investment. And the key? Social media, according to Ieuan Evans, Head of Membership and Supporter Engagement. It’s an observation that surfaces time and again in successful social media campaigns – that the heart of it is about building valuable connections. When brands can play the role of matchmaker, the effect can be good for everyone. For those who had never considered membership before, or perhaps meant to join and not got around to it, there was a fresh set of incentives – the reduced membership fee, a prize draw and the connection with fellow enthusiasts. That open networking is something that Twitter excels in, above other platforms. It’s a good reminder that our biggest support can come from somewhere we least expect – and that by playing out our ideas online, in the open, we create a chance for these connections to be made. The BTO ran the campaign again in 2014, this time without print materials but with the involvement on Twitter of their newly-arrived president, Springwatch presenter Chris Packham. The campaign’s reported to have been equally successful. We decided that it was time to venture beyond the studio and get our hands dirty, so we got in touch with Moulsecoomb Forest Garden. Home > Our Thoughts > Twitter: for the birds?